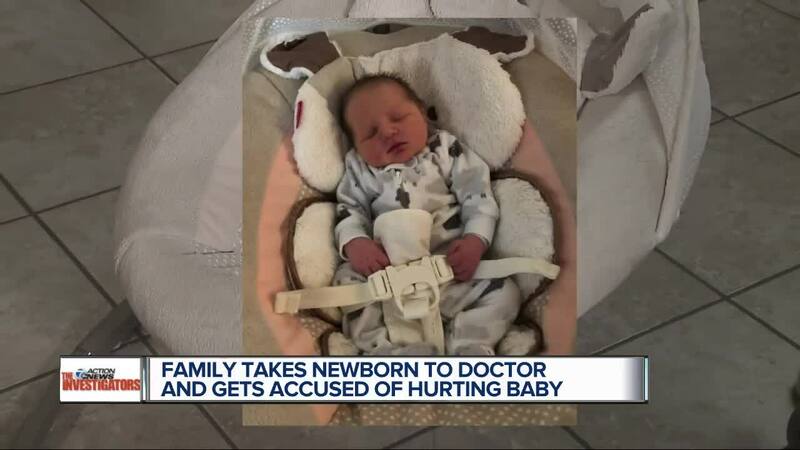 (WXYZ) — A family from Westland says when they noticed a mark on their newborn’s stomach, they took him to the doctor right away. But Allie and Jimmy Parker were stunned when a University of Michigan doctor accused them of abusing their baby. When Dylan was 6 weeks old, the Parkers noticed a strange mark on his stomach. The infant had been in his baby swing that morning. A pathologist later testified that the mark resembled the swing’s harness buckle, but because it looked like a bruise the Parker’s pediatrician said they needed to go to the hospital. “So, one of my biggest pet peeves in terms of terminology is the word accident,” said Dr. Mohr during a presentation she gave to first responders back in 2015 that the 7 Investigators covered. Jimmy said he thought the accusation was outlandish. “I was like, 'Honey, they think we hurt him,'" Jimmy said. "And it was still kind of unbelievable." Allie and Jimmy say they were not told Dylan’s four rib fractures were 5 to 7 weeks old, which experts say means they could have occurred during delivery. The Parkers say they also were not told about Dylan’s other lab results. “Nobody ever brought up the fact that his vitamin D was so low,” Allie said. “Before she spoke with Jimmy, before she even examined Dylan, she – from her personal cell phone – called someone at CPS and said I have Ms. Parker here and she wants to know if she can continue to nurse Dylan," Allie said. "'Nope, absolutely not – no contact,’" was the response. Allie said she then broke down. "Now you’re telling me I can’t even nurse my son,” she said. Child Protective Services workers removed Dylan and 1-year-old Isabella from the Parkers' care, and for 3 weeks Allie and Jimmy were not allowed to see their babies at all. “We didn’t get to get up at night and get to rock him at night, sing to him,” said Allie Parker through tears. “Which is an extreme amount of medical certainty," Satawa said. "And I had never seen a doctor ever in my 25 years of doing child abuse cases say that it was diagnostic of abuse." “She’s in a position of enormous unquestioning power," Satawa said. "I mean, when she says it’s child abuse – no one says, ‘oh no it’s not,’ until these people have had their kids taken away and have a lawyer actually challenge, investigate on their own and challenge the finding." Allie said she works hard as a mother to make her kids happy and healthy. “We are not rich but we do whatever we can to make sure those kids are happy and healthy," Allie said. "And for someone to tell me that I’m not doing a good job and to go so far to say that I would hurt one of them – it’s not right. It’s just not right." Several years ago, Michigan Medicine was one of two health systems in the state that served as a consultant to assist Children’s Protective Services in interpreting medical findings in cases of suspected abuse/neglect. The contract with Michigan Medicine ended in December of 2015 and we have not contracted with the State of Michigan for consults since that time.